Mission Statement: To protect and improve the environment in the Yellow Creek Watershed located in Carroll, Columbiana, Harrison, and Jefferson Counties. Jefferson, Carroll, Columbiana, and Harrison counties. Yellow Creek flows toward Hammondsville where it drains to the Ohio River. Acid mine drainage, bacteria, sewage, agriculture. This watershed is severely affected by acid mine drainage, which comes from abandoned underground mines and unreclaimed surface mines in the area. The area has been mined since the 1800s, and there is still active mining in the headwaters of the sub-basin of one of the tributaries, Brush Creek. Yellow Creek also suffers from high levels of bacteria in the water. Sources of this pollution include failing septic systems, cattle with direct access to streams, historic surface and subsurface mines, and run-off from agricultural landscapes feeding lake production. The land in this watershed is dominated by forested areas. Founded in 1998, the Yellow Creek Watershed Restoration Coalition (YCWRC) is a grassroots group composed of concerned citizens, land owners, business owners, and local, state, and federal governmental agencies to help preserve and restore the quality of Yellow Creek Watershed. The coalition began when Brush Creek Township Trustees contacted the Jefferson Soil and Water Conservation District out of concern for acid mine drainage pollution in area streams. Since then other sources of pollution in the watershed have been discussed at bi-monthly meetings and through surveys of watershed residents. The YCWRC is now an incorporated 501(c) 3 organization that has grown in size and capacity since its inception thirteen years ago. 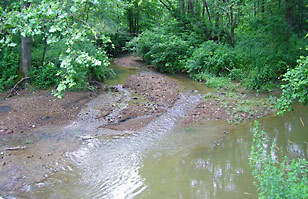 The coalition’s mission is to restore and protect the water quality in the Yellow Creek Watershed. The coalition has adopted bylaws and a Conflict of Interest Policy that it endorses yearly. The Yellow Creek Watershed Restoration Coalition has received funding from the Ohio EPA, the Office of Surface Mining (OSM), the Natural Resource Conservation Service, the Jefferson Soil and Water Conservation District, and Women in Mining.